What better month than February to feature a cheese called Oh my Heart? Look for this sign at your participating Neighboring Food Co-op to find this month's delicious, specially-priced "Cave to Co-op" regional artisan cheese. 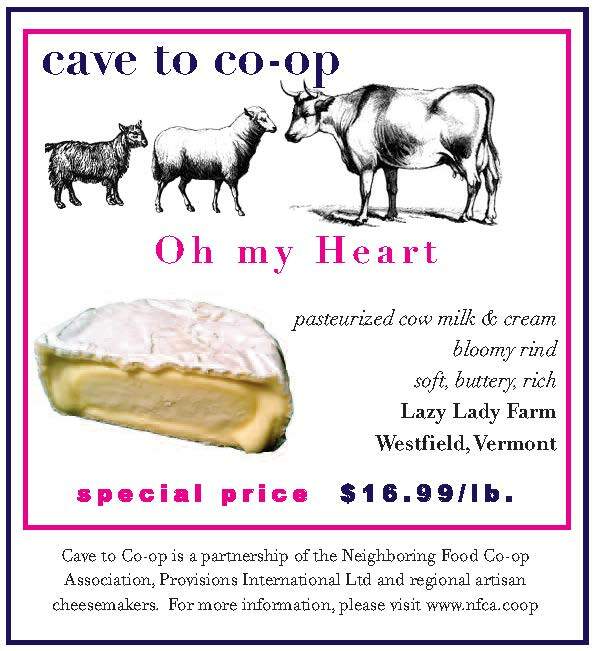 A very special cheese made by a very special farm, Lazy Lady Farm in Westfield, Vermont. Laini Fondiller started Lazy Lady in 1987 and it is as eclectic and unique as Laini herself. While not certified organic, the farm operates using organic practices: organic grains, organic straw for bedding, intensive rotational grazing, and fertile soils made from composted manure and the added minerals for hay production. Laini operates the farm by utilizing 17 solar panels and a 1K-wind generator. When there is no wind or sun, Lazy Lady relies on a small generator to replenish the battery bank. Laini raises and milks a herd of over 40 registered Alpine goats, a far cry from the handful of sheep and one goat named Blooper that she started with 25 years ago. Then the farm was operated with candles, gas lamps, hand water pumps, outdoor privy and a car battery for running a radio. From 1987-1994 cheese was made in the kitchen. Their first licensed ‘plant’ came in 1995 and it was a 10 x 12 room where Laini made cheese in 5-gallon batches. The first proper cheese cellar was built in 1996. In 2003, with the help of a loan from the Vermont Community Fund, a larger plant with a 50-gallon cheese vat was built, allowing Laini to make cheese 5 days a week. In 2009 a second ripening cellar was added. The old cellar is used for aged natural rind cheeses, washed rind cheeses, alpine cheeses and blue cheese. The other is used for bloomy rind cheeses. Both of these cellars are geothermal, are over 15 feet underground and maintain temperatures of 40 degrees in the winter and 55 degrees in the summer. Laini operates lazy Lady Farm with Barry Shaw. They employ 2 full time workers and 1 part time person who comes 2 days per week to clean the barn, and to pet the goats and the dog. Laini walks the goats in the woods, weather permitting, to ensure they eat their fair share of herbs and woodland plants. They are sincerely and lovingly cared for, each and every one. She calls them her ‘working girls’ and they are anything but lazy! Laini makes many varieties of cheese, following the seasonality of her herd’s milk production. She is a woman of intense curiosity and strongly held opinion. Frequently she names her cheese to fit a particular politician or political issue of the moment: Barick Obama, BiPartisan, Fill-a-Buster, Condi-Send, Tomme d’Lay and Big Bang. Laini is regarded across the country as an American cheesemaker who has remained true to the art of the profession and the lifestyle of a small farmer. Working 60+ hours a week, Laini answers to no one but herself and that herd of goats. A bona fide Vermont pioneer whose cheese is consistently delicious, clean and exciting. Oh my Heart is a small, soft, fatty, buttery disk made from cow milk and cow cream. A double cream bloomy rind that is luscious and addictive, Oh my Heart is the perfect cheese with which to lure the affections of your one true love. While we normally provide recipes, we believe that Oh my Heart should be enjoyed unadorned and naked, so to speak.